The aisleless nave is late C11, with an almost certainly C13 tower and a C14 chancel. Some wall paintings are mostly C13. As late as 1950 the church stood in open downland. Evidence of a deserted village dating back to the C13 was found a quarter of a mile east of the church (3 p54), but in the C19 the population was so small (79 in 1881 (2 p181)) that the living was united with West Blatchington and then until 1951 with Portslade (Dale p224). Like other shrunken villages in the area, the main reasons were population movement and sheep farming. Today houses surround the church and only a green recalls its rural past. The nave is probably late C11. It has herringbone masonry in both side-walls, with small round-headed windows, their heads formed from single pieces of stone, and plain round-headed doorways. These are broad in relation to their height and the walling ranges in thickness from 3ft to 4ft. Both argue against the pre-Conquest date proposed by Barr-Hamilton (p103) and others. The simple, unbuttressed tower has a plain pointed arch, a west lancet and a single bell-opening. Two corbels beneath the later battlements have been ascribed to the C12 (www.crsbi.ac.uk retrieved on 8/4/2013), though this is at variance with the remaining evidence which points to a C13 date for the whole tower. The VCH (7 p281) suggests the tiled cap is a relatively recent addition, but the Sharpe Collection drawing (1802) shows a similar one. In their present form the battlements, though convincing in appearance, date only from 1969 (BE(E) p271). The single lancets on both sides of the nave towards its eastern end are renewed, though the Sharpe drawing shows a similar one on the south side. There is no chancel arch, but vestiges of a transverse wall on the south side near the junction of nave and chancel suggest there was one. It could have been C11 and was possibly removed when the chancel was rebuilt in the C14. This rebuilding was thorough, for there is no herringbone or other sign that an existing structure was extended. All the side-windows are trefoiled lancets, the south west one a lowside. Though restored, they are as on the Sharpe drawing. The C19 east window replaces three equal uncusped lights set in an otherwise blocked opening, which Nibbs (1851) shows; these were clearly post-Reformation. 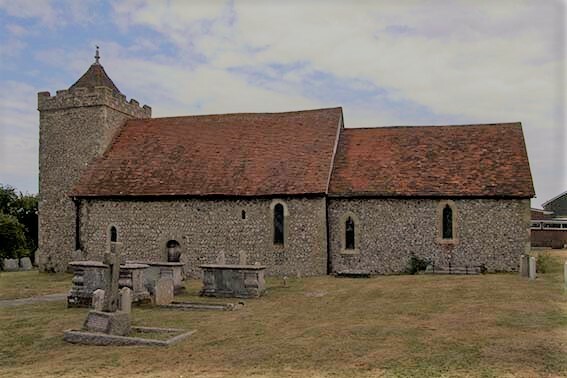 The tiebeam roof spans both nave and chancel and most timbers are probably C14, if not earlier; so probably is the bell-cage on four posts within the tower, an arrangement found also at St Nicholas, Portslade nearby. After the C14 little was done. 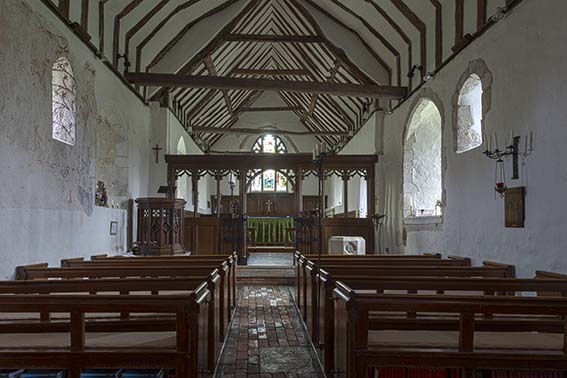 Unlike some nearby parishes which lost most of their population, the church remained in use and in 1724 the Bishop’s visitation reported its condition as good, except the chancel roof (SRS 78 p132). The Sharpe drawing confirms this and Nibbs and Quartermain show it reasonably intact in the mid-C19, though at much the same time Hussey (p233) called it ‘in melancholy condition’. Thus, evidence about its condition at the time is conflicting. On the one hand the incumbent is stated in 1856 to have repaired the church ‘lately’ (Parliamentary Paper XLVII pp165-70; my thanks to Martin Jones for this reference). However, on the other, according to Lower in 1870 the church was open to the sky (1 p209) and in the same year there is said to have been a restoration (4 p8). The architect’s name is not known and it is probable that this date should be 1875. The present east window in C14 style has been dated to this occasion, though there is some doubt. It is, however, likely that the lancets in the nave and chancel were renewed then. The east window appears to have been altered in 1909 by W Tapper (1 p215), but despite this the church was little used. 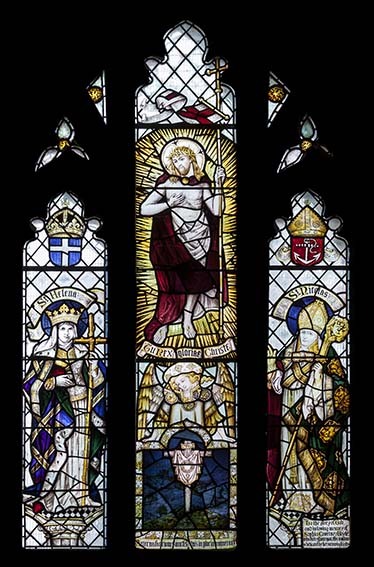 In 1929-30 £750 was spent on repairs (CDG Dec 1930 p382), which included further alterations to the east window. There was work to the roofs in 1948-49, during preparations for the re-establishment of a separate parish, including stripping plaster (4 p11), and in 1969-70 the C11 nave windows were re-opened. A smaller south west lancet in the nave, shown neither on earlier depictions of the church nor in W H Godfrey’s plan in the VCH (7 p281) (before 1939) and not apparently old, could date from either of the latest repairs, as could the opening of the north doorway and the vestry and porch. Fortunately, these repairs have not spoiled the atmosphere of the church, which keeps its sloping floor of mellow brick. Today, the principal parish church is St Richard, Hangleton and the future of St Helen’s was cast into doubt in 2003, following the plans for the re-organisation of parishes in the city. The more drastic proposals in this have not so far been realised, but there was a proposal for redundancy in 2011, partly because of structural problems. However, in 2018 regular services continue to be held so the proposal has been staved off. Aumbry: (East wall, behind panelling) Probably C14 with a pointed head. Carved stone: (Sill of north chancel) What appears to be a ram’s head, possibly a further piece of the presumed C12 corbel-table of the tower (www.crsbi.ac.uk retrieved on 8/4/2013). Font: C19 or early C20 round bowl, replacing a lead one of 1719, recorded in 1865 (3 p16). 1. (East window) St Helen and St Nicholas with Christ in the centre light, set in clear glass by W B Reynolds, 1909 (1 p215). 2. (North nave, second window) A single armoured figure of St George, reflecting the mood of the date by J Hardman and Co, c1919 (WSRO Fac 2076). 2. (Churchyard south west of church) Tombstone to David and Eliza Robson (d 1956) by E Kennington (ibid). They were the parents of the famous actress Dame Flora Robson. Paintings: (Nave) Traces were found in 1969 and simple scrolls and foliage in the rere-arch of the C11 north window were uncovered in the following year. There is further scrollwork on the north wall and all is probably early C13. 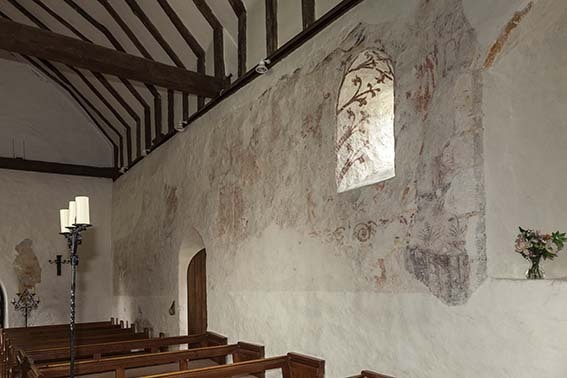 There appear to have been figures, which were painted over in the C14 and C15. All that was recognisable was a probably C15 St Christopher, much of which was removed, as it had been painted over one of the re-opened windows (4 p14). 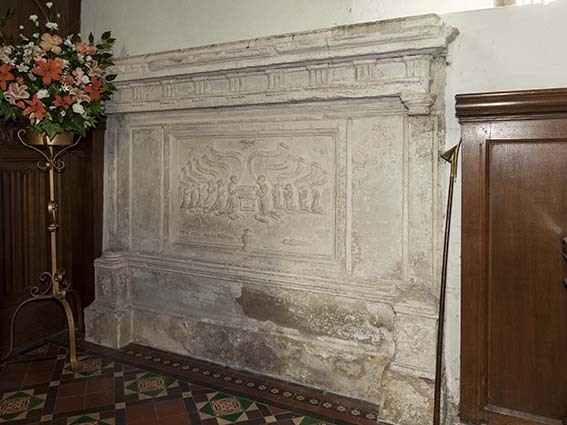 Piscina: (South chancel) C14 ogee-headed. Royal Arms: (Nave) C17 fragmented remains of painted arms, chiefly the lion. Stoup: (By south doorway) Probably C13 or C14.